In India, students generally do not devote much time to think and decide before taking admission in a course. Mostly, they go by the elimination method, that is, they eliminate the things they think they are not good at or those subjects that they hate. The reason given by the students for this elimination are mostly irrelevant to the decision making process. They feel they may not have time for fun if they take serious subjects or some careers do not lead to earning great money etc. One should be aware about one's strengths and long term goals and then decide the course option. As regards choosing from BBA or B Com is concerned, this one of the classic confusion faced by almost every commerce aspirant. For many commerce students the priority lies in getting into a job quickly and earning money. This is why BBA tops the list for many students. MBA is one of the most preferred course choice in Post Graduation for commerce students and both BBA as well as B.Com lead to MBA. However, while B.Com can lead to a wide array of post graduate specializations, a BBA degree on the other hand, mostly leads to MBA. For a second do not think that you don't have many choices, be smart people take an Aptitude and Personality Test gather information about courses after 12th commerce , and then take the decision confidently. 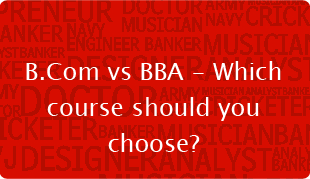 Let’s come back to our topic and know about what will you learn in B Com / BBA. The Bachelor of Commerce is designed to enhance the ability to learn as the students study variety of subjects: Accountancy, Business Administration, Finance, Economics and Industrial Policies. This course equips one with the analytical, communication and problem-solving skills to effectively identify issues, source information and to find efficient and practical solutions. These days students can opt for B Com with various specializations like International Accounting / Company Secretaryship / Entrepreneurship / Business Analytics / Travel and Tourism etc. After B.Com the students can avail exciting and diverse post graduate opportunities like MBA, LLB , CA, CS , CFA, International studies, Designing/Merchandising, MBE, M. Com, Finance, Economics, School and College Teaching etc which will set them apart from the crowd and prepare them for success in the global marketplace. The industry takes them at par with the students having professional degree like BBA, Hotel Management etc and sometimes at higher platform if someone is from reputed college. All most all universities and colleges in India offer B.Com degree, therefore, chances of getting into the course is higher. Bachelor of Business Administration, on the other hand, is a professional course, and it is offered at few universities and of these, only a handful of colleges / institutes offer quality course. Choosing the right institute is key to landing up in a good job. The BBA course is tailored in consultation with representatives from leading organisations, ensuring that you graduate with an industry-relevant degree. Students get practical experience, read assigned materials, attend seminars, and prepare an internship report. Students are encouraged to attend leadership training workshops and conferences; including, but not limited to, public speaking, group dynamics, and problem solving, and evaluating techniques. These skills may help you to get a good job and work experience may help you in getting selected at a good MBA college. The students get an edge over others in academics while studying MBA. After BBA the students can get into Marketing, Human Resource, General Management, and Finance, LLB, CFA etc. This course, however, restricts the students from other postgraduate study opportunities like BBA students are not eligible for M Com and many colleges also do not accept BBA course for MA Economics as well. If you are very sure that your aptitude matches to the management study only, your only goal is to get into management career, then BBA would be the best choice for you. If you wish to learn variety of skills as well as academic subjects during bachelor degree, wish to avail various post graduate opportunities besides MBA, interested in learning finance and factors that drive economic behavior at both an individual and organisational level, then B.Com would be a wise decision. However, if you decide a career based solely on your "wish", and not on your "strengths", then you increase the chances of leading a miserable and stressed life. Career decisions must always be made keeping in mind one's aptitude, personality as well as interests. To know this clearly, one can take career tests or aptitude test and personality test and get career guidance from expert career counselors to build the right career path.